Not much has changed over the years. Of course, some of the Pujas have got considerably bigger and one can only imagine that new and multiple sources of funds must have opened up for some of them, including corporate sponsorships in some cases. A veteran organizer told me that one can't hope to be a high-profile, 'celebrity' Puja without political patronage. While this used to be the case selectively earlier, it seems to be quite the norm now. Owing to greater numbers of folks travelling both within the country and outside, considerably greater media exposure and the wealth of information and images available over the internet, pandals, in many cases, have become far more imaginative and often resemble famous structures, architectural wonders and places of worship. Some choose to depict recent global or national events, using a variety of light and sound effects to good measure. Consistent with the growth of population, the crowds have swelled and their composition has undergone a change too. There are possibly many more out-of-towners than there used to be before, thanks possibly to greater mobility and an improved public transport system. At the same time, quite a few erstwhile revellers have decided to give pandal-hopping a miss these days and have elected to either stay put at home or socialize within tight-knit closed circles in their vicinity or, if possible, go out of town altogether to avoid the daunting crowds, the congested roads and the heightened noise pollution during the days of the Puja. As a public spectacle, drawn out over five days, it has few peers within India or even globally. While the closest thing to Durga Puja is the annual Ganesh Chaturthi festival in Mumbai, being a very vibrant commercial and financial hub, nowhere is the extent of shutdown or the crowds thronging the pandals and the roads and bylanes in Mumbai comparable to what one gets to see in Kolkata. The Bengalis, normally a somewhat laid-back lot, appear to be totally charged up and brimming with energy during the days of the Pujo. Folks who exhibit disdain about exercising regularly are prepared to walk for miles, braving the heat and the crowds, during these days. Above all else, the Durga Puja @Kolkata is a visual spectacle which has few peers. 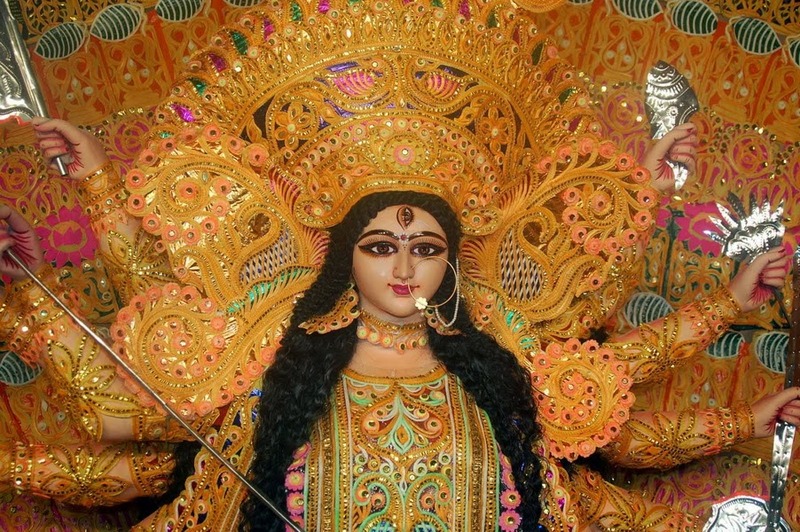 The embedded slideshow as well as the video clips endeavour to convey some of the flavour and the mood which gripped the city during during Durga Puja 2013, celebrated from the 10th to the 14th of October.